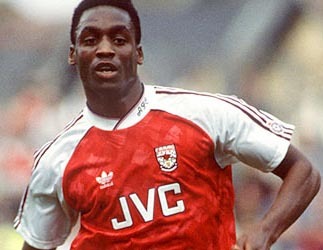 Q1 – Who scored a hat-trick in Arsenal’s 5-1 opening day victory over Wimbledon on the opening day of the 1988-89 season? Q2 – Which player wore the number 22 during the 2000-01 season? 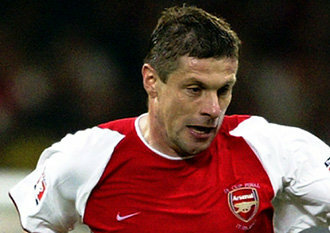 A2 – Oleg Luzhny – The Ukranian made a total of 110 appearances for the Gunners between 1999 & 2003 never scoring a single goal. The last of those appearances came in the 2003 FA Cup Final at Cardiff’s Millenium Stadium which saw the big defender collect a winners medal before moving to Wolves on a free transfer that summer. Q3 – Who made their only Arsenal appearance in the League Cup against Everton on the 8th November 2006? 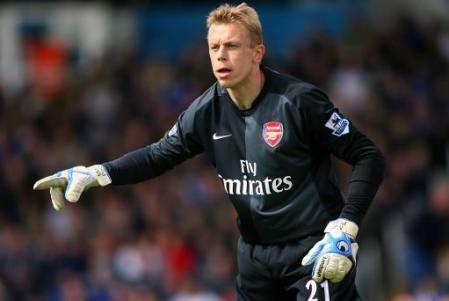 A3 – Mart Poom – Despite not even appearing on the bench in Paris the Estonian shot stopper collected a Champions League runners up medal after being named in Arsene Wenger’s 25 man squad for the final. Q4 – Which former Arsenal player became manager of Bishops Stortford FC in 1999? 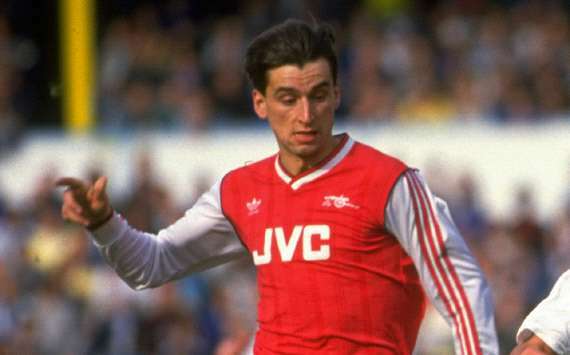 A4 – Martin Hayes – After leaving Highbury in 1990 Hayes turned out for twelve different clubs. The last of those was Bishops Stortford where he became player-manager in 1999 and remained at the helm until 2008. Q5 – Which former Arsenal defender also played for Cambridge United, Dagenham & Redbridge and Hong Kong Rangers? 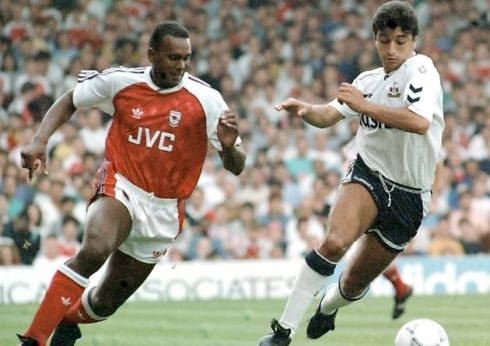 A5 – Gus Caesar – Despite making only 51 appearances for the Gunners between 1984 and 1991 Gus Caesar is a player who has become part of Arsenal folk lore mainly for the error which sparked Luton Town’s comeback in the 1998 Littlewoods Cup Final. 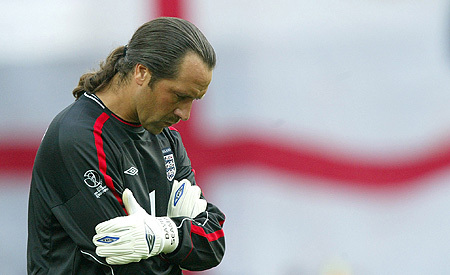 Q6 – David Seaman became the oldest player to feature for England in a European Championship qualifying match in 2002 during the three lions 0-0 draw with which side? A6 – Macedonia – Despite being one of the greatest Goalkeepers this country has ever produced and winning 75 caps for his country the big Yorkshire man is still tainted by the memory Artim Sakiri’s goal directly from a corner kick in a 2-2 Euro 2004 qualifier, ironically also against Macedonia. Q7 – Which former Arsenal legend was the first to make tournament appearances for England in three separate decades? Q8 – Who was the Arsenal’s sole member of England’s 1966 World Cup Squad? A8 – George Eastham – The former Newcastle inside forward, who went on an eight month strike in 1960 when the Magpies blocked his move to London despite the players contract having expired, was named in the England World Cup squad by Sir Alf Ramsey. Despite scoring in a pre tournament friendly against Denmark Eastham didn’t make it onto the pitch at any point during the three lions historic triumph meaning he didn’t collect a winners medal (He did retrospectively collect a medal in 2007 along with all the other non playing members of the squad) 1966 was also the year Eastham left Highbury, moving on to end his career with Stoke City. Q9 – Which former Gunner is the only player to receive a medal before an FA Cup Final? 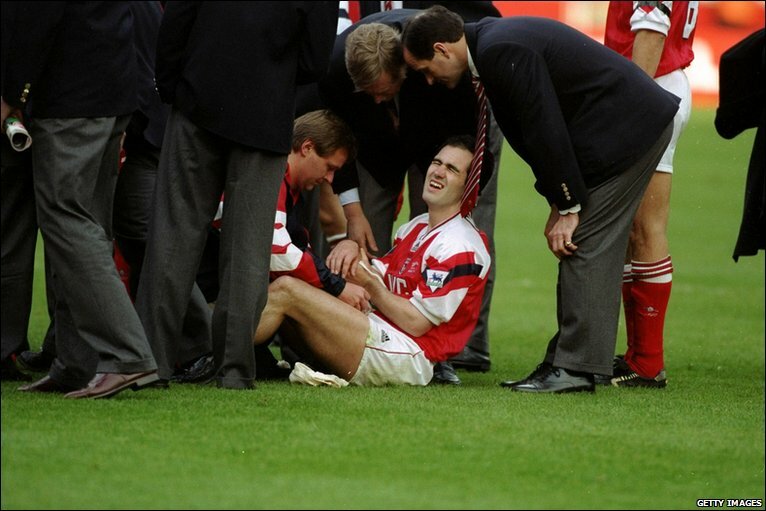 A9 – Steve Morrow – After scoring the winning goal in the League Cup Final victory over Sheffield Wednesday in 1993 Steve was unable to collect his winners medal after being dropped on the hallowed turf by skipper Tony Adams during the teams celebrations at the final whistle and subsequently being rushed to hospital. Steve was presented with his winners medal before the FA Cup Final, also against the Owls, a month later. Q10 – Which Maidstone United & Arsenal player was the youngest player on the pitch in the 1994 UEFA Cup Winners Cup Final? A10 – Ian Selley – The midfielder made a total of 51 starts during his Arsenal career and may have added even more had he not suffered the agony of a shattered left leg in a game against Leicester City in 1995. Selley spent more than a year recovering from the dreadful injury but after a loan spell with Southend United midway through the 1996/97 season he was sold to Fulham where he suffered another broken leg shortly after arriving at Craven Cottage. After his spell with the cottagers Selley moved Wimbledon before taking on a tour of the lower leagues of English football which included stints at Woking, Lewes, Maidestone & Dorchester Town. Ian is still playing and is currently on the books of Isthman LEAGUE Premier Division side Kingstonian. I wonder how many players with European winners medals the K’s have had? Q11 – Who was in goal for Arsenal when John Jensen scored his only goal for the club against QPR on New Years Day 1994? 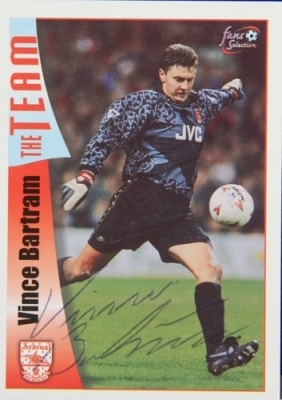 A11 – Vince Bartram – Bartram moved to Highbury in August 1994 from AFC Bournemouth in a £400,000 deal. Understudy to David Seaman during his four years with the club the most famous of the keepers eleven starts between the sticks for the Arsenal must surely be that game on New Years Day, I wonder if he has one of those ‘I was there when Jensen scored’ t-shirts? Q12 – Which former player of Malaysian side Sabah and Arsenal legend was capped 14 times for England? A12 – David Rocastle – The man they called Rocky was an Arsenal legend in every sense of the word. An Arsenal fan, the Lewisham lad rose through the clubs academy ranks to become one of the finest footballers to ever wear the famous red & white. During his time at the club Rocastle made 277 appearances, 260 of them starts, and was an integral part of every Arsenal team he played in helping those sides to the 86/87 League Cup as well as the 88/89 & 90/91 league championships. In the summer of 1992 the midfielder was devastated when George Graham told him he had accepted an offer from Leeds United for his services. Begrudgingly Rocky moved on but his time at Eland Road and subsequently Man City, Chelsea, Norwich and Hull he was unable to capture the form he had shown at Arsenal and the player ended his career out in Malaysia with Sabah. 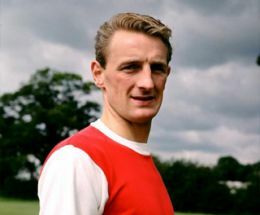 Rocky was always held in high esteem by all Gooners and it was with great sadness that the news came in March 2001 that aged just 33 David lost his battle against non-Hodgkin’s lymphoma. The memory of the man will never be forgotten he was as true a Gooner as anyone has ever been. Well either way I quite enjoyed thinking back on some of the players mentioned above, the part they played in our great clubs history and their football lives outside the Arsenal. I hope that you also found that enjoyable at least?